Pirate Jewelry has one of the largest selections of sterling adornments for the fashion-conscience scaliwag I’ve seen to date. Their items range in style from tribal to gothic and from symbolic to traditional. And whatever your chosen style, they frequently have a number of subtley (and not so subtley) different options for you. 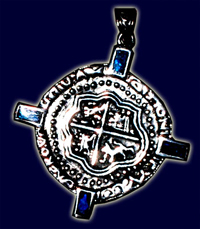 In their catalogue Pirate Jewelry offers a number of spanish coin styles. The one I chose has four colored inlays set around it like the directions of a compass, giving it a nice decorative flair. The pendant itself is single-sided, being a textured surface on the reverse. The front, however, is both beautiful and striking. Imperfectly round, it gives the impression of sunken treasure. The great thing about wearing a doubloon is that it can convey your pirateyness without intimidating your granny (as a skull and crossbones might), so this is definitely a worthy piece of jewelry. It’s a might on the thin side, but solid and with a welded bezel for strength. If you’re looking for something a bit more scandelous, Pirate Jewelry also offers its Pirate Cross. Perfectly piratey, but not definitively so, this piece could easily be of interest to bikers, goths, and celtic morticians. It’s a traditional cross shape but features a grinning skull on each end. Like the coin pendant, the cross is thin, lightweight, yet reasonably sturdy. Should they strike your fancy, either of these pieces are of fine quality and almost completely accurately represented on their online catalogue. The only exception is on the coin – at their webpage each of the four points is a different color, while on my own two are blue and the other two green. For me this was no problem, but if you’ve your heart set on a different color for each direction, you might want to call ahead. Fine work, fine craftsmanship, and fine products! This entry was posted in Jewelry and tagged peter stone by Bilgemunky. Bookmark the permalink.